Blend all marinade ingredients in a food processor and place in a bowl. Add tofu into marinade in bowl. Let it sit for at least 2 hours. Skewer 4 pieces of tofu onto a wooden skewer that has soaked in water overnight. Continue until all tofu has been used. Combine all salad ingredients into a large bowl. Stir in salad dressing and toss. Barbecue the tofu for around 3-4 minutes on each side-- until golden brown. Sit 2 skewers a top 2 cups of salad in a shallow bowl. Provide chopsticks as utensils. Combine all ingredients in a food processor. Place in small bowl or small mason jars overnight. Seal the lid or cover the bowl. 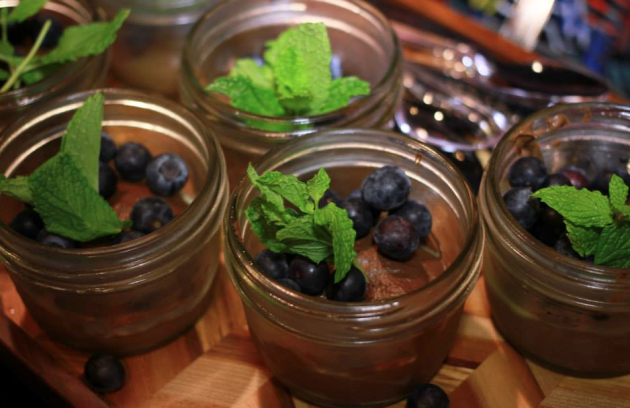 In this case I used small mason jars as they are adorable to serve but they can be stacked in the fridge after being sealed air tight. Before serving, garnish berries and a sprig of mint. I used the same mushroom recipe from above but instead of using the basil leaf as the wafer on which to serve the mushrooms on I uses Parmesan infused tortillas. Whilst the mushrooms are barbecuing, I placed each individual tortilla in the oven (not on a baking sheet). I cooked each until crisp. I then added one quarter of a cup of shredded. Parmesan on each tortilla and placed 6-7 pieces of mushroom atop the cheese. I then returned the tortillas, on a baking sheet, to the oven, and cooked until the cheese was melted. I cut the tortilla into 6 pieces. And before I could say, "Luvvies", the guests have devoured them all. I peeled the portobello mushrooms and removed their storks. In a bowl I soaked the portobello mushrooms in the extra virgin olive oil and massaged every last bit of the oil into each mushroom. I add shredded basil leaves taken from the smaller leaves that are too small to use as the wafer on which I would later serve the grilled portobello mushrooms on. I diced up the garlic cloves and sprinkle over the portobello mushrooms. I add the sea salt and cracked black pepper and then place on a hot grill on the BBQ. I like to cook the mushrooms for at least 2 minutes on either side. Once removed from the grill I placed the portobello mushrooms onto shallow dish and sliced into pie shapes. I tend to cut approximately 8 pieces per mushroom. 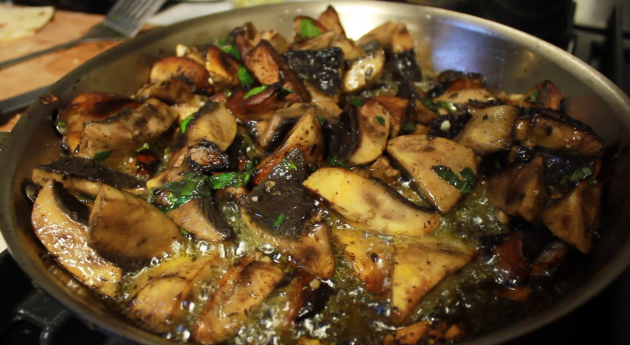 With the juices oozing out of the cut mushroom, the pieces marinate in the amazing combination of flavors. I then place each pie piece on an individual basil leaf and serve. In a wide flat bowl, I squeezed one lemon and rolled in a log of goats cheese into the juice. I the added salt and pepper and kneaded the goats cheese into the accumulating flavors. I then added extra virgin olive oil, thinly sliced green onions, chopped basil and chopped parsley. I sliced the pears like thick wafers. I smeared the goats cheese on the pear as one would peanut butter onto a sandwich. I then sprinkled with pancetta and on a separate batch I sprinkled pomegranate seeds (for the vegetarian). Voila lean deliciousness. Sauté half a red onion, half a brown onion and four garlic cloves in 1 tablespoon of extra virgin olio. Once transparent, pour ingredients into a blender and blend into a cream. Return the onion mix to the sauté pan and add 4 ripe diced tomatoes with 6 sliced basil leaves. Once the tomatoes have cooked and infused with the onions, add 2 cups of tinned whole tomatoes. Add ground black pepper and another 6 clicked basil leaves. Simmer on low heat for 30 minutes and then all all ingredients into the blender and blend. Pour over the pasta and serve.